Looking for a different mobile phone? Start shopping for deals today on the new Sony Xperia X with TigerMobiles.com. Great performance, beautiful design, and top end cameras make this one of the most desirable high end mid range phones out there. Want to get your hands on one? Then check out the great deals on the Sony Xperia X below. 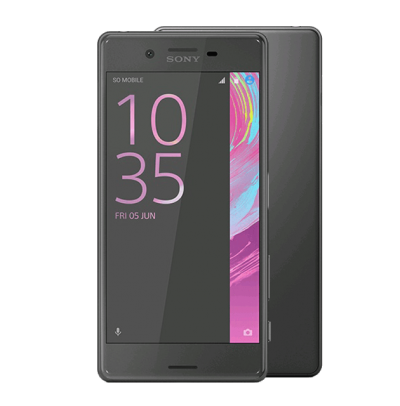 The long loved, high end Sony Xperia Z brand has finally been retired, and the manufacturer have instead announced three new devices in the new Xperia X line. The simply named Sony Xperia X is the middle of these three, and though it’s at the upper end of the mid price range, it’s got a whole lot to offer, not least its beautiful design. Why should you buy one? The main draw here is the camera set, something that Sony always do well, and the Xperia X is no exception. But the X also gets solid performance specs, and some very attractive styling as well. Mid range phones are ten a penny, but the Sony Xperia X is certainly one of the best out there at the moment. Sony phones are always sleek, and the X is no exception to that rule. Lines are sharp, angles are slightly curved, and the metal body of the X feels very premium to the touch. It sits firmly and securely in the hand, and has a minimalist look that’s both attractive and functional at the same time. Underneath that shell are some very satisfying specs. The Xperia X sports nice hexa core processing, a fair bit of RAM, and some of the best cameras around, bar none. The display is solid, and there are even a few extra features thrown in for good measure. The Xperia X has fantastic styling, and is a truly attractive phone, but it’s also got decent performance. If you’re in the market for a mid range phone that looks high end, then the X is a clear choice, and you won’t be disappointed in what the X can do for you either. First, let’s look at performance, which is a major concern when buying any smart phone. The Xperia X has hexa core processing, running a dual core 1.8 GHz processor alongside a quad core 1.4 GHz model. You’re also getting 3 GB of RAM, which is high for this price point, resulting in a phone that’s speedy and responsive, even when running multiple processes. As an Xperia, the X is an Android device, and it’s running the newest Android version, 6.0 Marshmallow, out of the box. That gives you the familiar customisation options and intuitive interface that you’re used to, along with some neat new features. The best of these is the new Doze function, which saves hefty amounts of battery power. No, this isn’t the fastest phone around, but it’s not the flagship device, so you wouldn’t expect it to be. However, it does offer very solid performance, and will more than satisfy the average phone user. The Xperia X is quick on its feet, with no lag, and the new Android version is even better than ever. So, display time. You’re getting a five inch screen, which is more than enough space for most of us, and does mean that the Xperia X can easily be used with one hand, and that it can slip into a pocket, unlike many big screened flagship devices. In terms of resolution, you’re not getting Quad HD, but again, this is mid range. What you are getting is a very respectable 1080 x 1920 pixel display, working out to around 441 PPI. It’s an LCD screen with IPS tech for great viewing angles. Images on the Xperia X were clean, crisp and had deep, true colour reproduction. For a mid range phone, the Xperia X has a decent screen, it’s nothing special, but it more than does the job. With a clear, true picture even when watching HD video, there’s really nothing that we can complain about here. For many, the camera set on the Xperia X is going to be the big selling point, and you’re getting a couple of very nice cameras indeed, though we expect that from Sony. At the front there’s a massive 13 MP camera, so your selfies are going to be perfect, and video calling is excellent. Moving to the rear and you’ve got a huge 23 MP device. Not only that, but there’s an f/2.0 apeture and a 1/2.3 sensor as well. If you don’t like tech jargon, then just know that that means incredible picture quality. And, of course, there’s LED flash, phase detection auto focus, HDR, face recognition, all the extras that you’d expect to see. This is truly one of the best camera phones around. If you’re serious about your snaps, then the camera set on the Xperia X is going to sell itself. You’ll get a perfect shot every time, and even the included camera software is excellent and easy to use. As a mid range phone we’re not expecting too many added extras, however the Sony Xperia X does offer a couple of things worth mentioning here. Firstly, there is a fingerprint sensor, which is becoming more and more common on mid range phones these days, but it does offer added security, which is always good. And then there’s the battery. The Xperia X has a 2620 mAh non removable battery, which Sony are claiming gives two days of life. We’re a little dubious on the two day mark, but regardless, with only a five inch screen to power, you’re sure to get at least a full day’s use out of the X. And when it’s time to charge, the X does feature Quick Charge tech to pump you full of juice faster than ever. Sony’s Xperia Z range was much loved, and the successor line, the Xperia X, looks set to become a firm favourite too. The upper mid range Xperia X has plenty to offer, including some amazing cameras, decent performance and good battery life, all of which are very desirable. In fact, this is probably one of the best mid priced phones around right now. As far as connectivity goes, there are no surprises. You’re getting 3G, 4G, Bluetooth and WiFi. There are two available version of the Xperia X, one with 32 GB of internal memory, the other with 64 GB. However, there is an SD card slot that allows you to add up to 200 GB of extra external storage. So, what don’t we like about the Xperia X? That’s tough. We’d prefer a removable battery, since that makes resetting easier, but not many phones these days offer that option. A Quad HD screen would be nice too, but at this price range that seems like a lot to ask. On the whole, the Xperia X is a great premium mid range phone, and has a lot of crowd pleasing features, particularly those cameras. If you’re looking for a great phone that isn’t going to cost you flagship prices, then the Sony Xperia X is going to be a very, very good choice indeed. Dan is our mobile phone review expert helping customers make better buying decisions. With a passion for technology and taking things apart Dan single-handedly reviews all the phones listed on the TigerMobiles.com website.